My latest column for History Today can be read online here. It was prompted by recent news about archaeological investigations at the site of Reading Abbey, which may result (among other things) in finding the tomb of Henry I. This is the year which holds the writer: the thirty fifth year of the reign of the glorious and invincible Henry, king of the English. The sixty-ninth year from the arrival in England, in our time, of the supreme Norman race. The 703rd year from the coming of the English into England. The 2,265th year from the coming of the Britons to settle in the same island. The 5,317th year from the beginning of the world. The year of grace 1135. Henry of Huntingdon, The History of the English People 1000-1154, trans. Diana Greenway (Oxford, 2002), pp.118-9. Henry I, our historian's namesake and one of his fixed points of temporal reference here, died on 1 December 1135. He was buried at Reading Abbey, which he had founded, and which subsequently became one of the richest and most powerful religious houses in the country. After a later King Henry wrought his usual destruction, the abbey church was largely demolished, the royal founder's tomb was lost, and the remaining buildings of the extensive site fell into ruins. You can read more about the current state of the ruins and future plans for them at this site. It dates to the early part of the twelfth century, the time of the abbey's foundation, and in context has fascinating significance in light of Reading's royal connections (on which see this article). The museum's other treasures include a full-size (!) replica of the Bayeux Tapestry, made in 1885 by the ladies of the Leek Embroidery Society. You can read about its story here - it's a quirky but wonderful tribute to Victorian medievalism, and well worth celebrating in the year which holds us, the 950th anniversary of 1066. One corner of the park is occupied by the little Victorian church of St James, which was designed by A. W. N. Pugin and built in 1837-40. Its buildings overlap with the site of the abbey church, which would have been more than three times the size of this building. 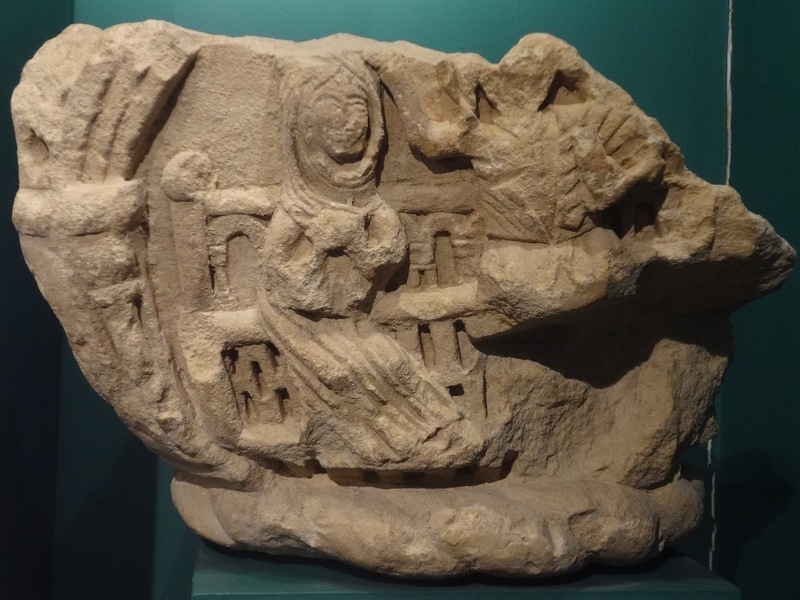 The dedication reflects a link with the medieval abbey: Reading Abbey possessed the hand of St James, an important relic and a great attraction to pilgrims. St James' claims to be the only Catholic church in England to stand on the site of a pre-Reformation abbey. Just next door, as it were, are the standing ruins of the abbey. They were closed to the public when I was there (for safety reasons; you can take a tour, though). Behind the gatehouse, still within the former precincts of the abbey, the scene quickly gets less picturesque: office buildings, chain restaurants, Reading Crown Court. Hidden among them is the abbey's mill stream, and a few fragments of older buildings. This is a bit of the old abbey mill, stranded among skyscrapers. It stands right at the foot of the Blade - as sharp a juxtaposition of old and new as you could ever wish to see. I was there on a Saturday afternoon, so these buildings were all empty and a little bit ghostly; it was a relief to get away from that glaring glass, back to the ruins and the nearby river. The riverside walk is now a memorial to Oscar Wilde, whose Reading Gaol stood next to the ruins of the abbey. Away from the abbey itself, Reading is well-provided with churches. I visited the town during the Heritage Open Days weekend, so they were all open and very friendly and welcoming (that's next week this year, should you wish to repeat my experience!). This is the church of St Giles, whose vicar was killed alongside the last Abbot of Reading, Hugh Faringdon, before the abbey gatehouse in 1539. The present-day church commemorates him as a martyr. In the centre of town is St Mary's, which they call Reading Minster. The church guide says 'Tradition has it that St Birinus founded a small chapel on the site of St Mary's church in the 7th century', which would make it one of the oldest churches in the area. Tradition also says that a nunnery was founded here by Queen Ælfthryth, wife of King Edgar, in penance for her involvement in the murder of her stepson, young Edward the Martyr. Ælfthryth was a patron of several religious communities for women (whether in penance or not it's not easy to say), and this takes Reading's royal connections back another 150 years or so before Henry I. It's right in the middle of town, and the doors were flung wide open, so that passers-by were freely wandering in and out. Both these churches (and St James' too) felt loved and cared-for, in their different ways, and very much alive - one had a wedding going on, another had many little candles flickering before a series of shrines, another a small group praying quietly together. It really is remarkable to think about such things going on in these places, century after century, as royal abbeys and empires rise and fall.